TeamViewer is an application for remote control, desktop sharing and file transfer between computers. It runs on Windows, Mac OSX and Linux (even though it comes in a .deb or .rpm, it uses Wine which comes bundled with it). The most interesting feature in the latest TeamViewer 6 is that it allows you to connect to your computer via an Android device. 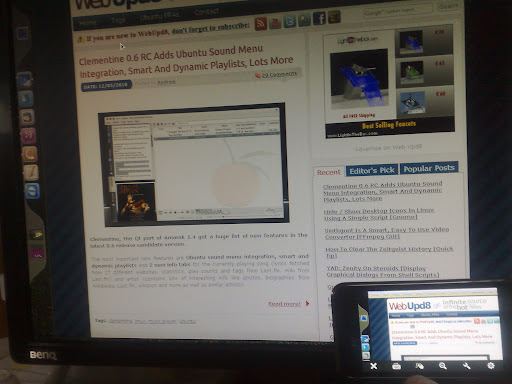 For this, you'll need the Android TeamViewer client installed on the mobile phone as well as the latest TweamViewer 6 installed on your computer. The Android version of TeamViewer is not available on the Android Market so you'll have to get it via TeamViewer downloads page (under "mobile"). Please note that the Android application is still in beta so you might find bugs. I didn't encounter any major bugs while testing but I've only used it for a couple of minutes. Some info on the usage is displayed the first time you start the Android version: drag one finger to move the mouse pointer, perform single-finger taps for clicks, two-finger taps for right clicks and so on. Download TeamViewer 6 (Free for non-commercial users). Thanks to linuxundich for the heads up on TeamViewer 6.